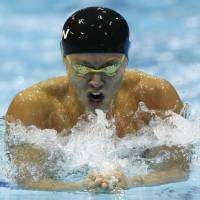 LONDON - Kosuke Kitajima did not redeem himself at the Aquatics Centre on Wednesday night. He failed to earn a medal, and he placed second among Japanese finalists in the men’s 200-meter breaststroke. Hungarian Daniel Gyurta captured the gold medal in a world-record time of 2 minutes, 7.28 seconds. Gyurta was the world champion in 2009 and 2011; he was fifth in Beijing at the 2008 Summer Games and the silver medalist at the 2004 Athens Games. Gyurta was aggressive in the final 100 meters on Wednesday, moving past Kitajima and fending off British silver medalist Michael Jamieson to emerge victorious. Jamieson finished the race in 2:07.43, a national record. Kitajima swam a stellar first 50 meters in 28.64 seconds, quickest time at that point, but faded to fourth over the final lap (2:08.35), while compatriot Ryo Tateishi finished strong en route to a bronze medal (2:08.29). Entering the London Olympics, the 29-year-old Kitajima was the two-time defending Olympic champion in both the men’s 100- and 200-meter breaststroke races. He was fifth in the 100 meters on Sunday. And still this remains intact: No male swimmer has won the same individual event in three consecutive Olympics. “I didn’t have any problems,” Kitajima told reporters, not revealing much. “I just tried to swim 200 meters as I always do. I have no regrets. There’s widespread speculation that after Saturday’s 4×100 medley relay Kitajima will officially retire as an Olympic swimmer, thus bringing an end to a dominant career that spanned nearly a decade as an elite swimmer. The London Games proved that younger swimmers have emerged at the top of the pecking order. Kitajima, who turns 30 in September, has had a great Olympic career, but it remains a giant question mark if he can once again replicate what he accomplished in Athens and Beijing, when all of Japan was mesmerized by his feats in the water. For first-time Olympian Tateishi, achieving a third-place finish produced a euphoric feeling. During his post-race interview, Tateishi also had a special photo opportunity in mind for his coach, Naoki Takashiro. “Then I would like to put the medal around my coach’s neck and take a picture because he had his birthday on Day One of the competition,” said Tateishi, a Kanagawa Prefecture native. Tateishi didn’t qualify for the 100-meter final, so he did not get a chance to go head-to-head with Kitajima in the first of two breaststroke races. Tateishi kept his poise during the first 100 meters of Wednesday’s 200 and pushed hard for a medal spot in the second half of the race. In his own perspective, “I was so calm,” he said, looking back at the way the race unfolded as he collected his first Olympic medal. Home-pool advantage fueled Jamieson’s effort as he battled Gyurta for the top spot in an exciting down-to-the-wire finish. “The crowd bringing us home in the last (50 meters) was unbelievable, and I thank them for that,” Jamieson said. In the women’s 200 butterfly, China’s Jiao Liuyang snatched the gold medal with an Olympic record time of 2:04.06. Spain’s Mireia Belmonte Garcia was second in 2:05.25, while Natsumi Hoshi gave Japan another bronze medal in 2:05.48. “I am relieved (by winning a medal),” said Hoshi, a native of Saitama who attended Kasukabe Kyoei High School. “I felt expectations from others and I have aimed to win gold at such a big stage. In the women’s 4×200 freestyle relay, the U.S. took the gold in 7:42.92, followed by Australia’s 7:44.41 and France’s 7:47.49. The Japanese quartet of Haruka Ueda, Hanae Ito, Yayoi Matsumoto and Aya Terakawa finished last in 7:56.73.